This year, I had a goal to go hunting. When I made this goal, I knew very little about hunting. I knew you needed some kind of gun and you go in the woods to shoot some kind of animal. Little by little, I figured things out, until I finally went on my first duck on last week which has been a year long culmination of preparation. Along the way, I learned about a world that was completely unfamiliar to me as a city-dweller. 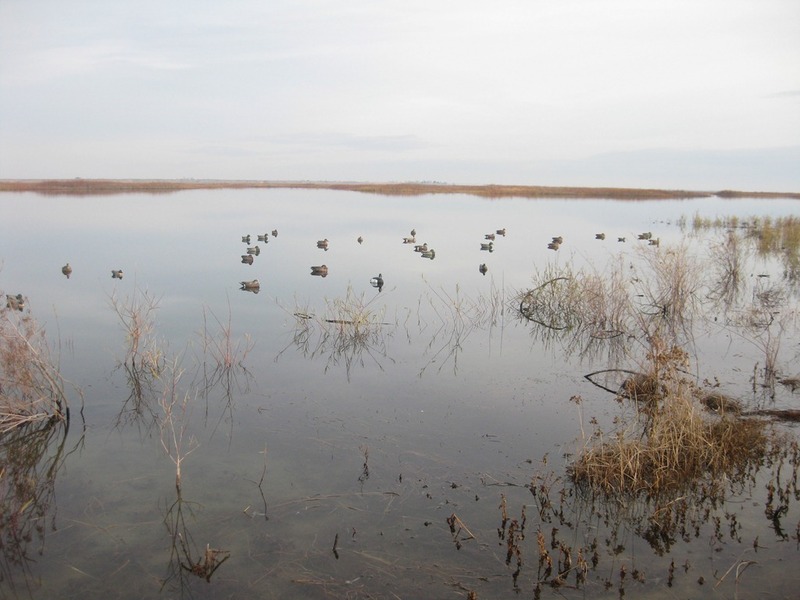 When I decided that I would try hunting some sort of waterfowl, I found out quickly that I wasn’t going to be able to do this with my .22 rifle. Waterfowl requires a shotgun. For the uninitiated, a rifle shoots a single bullet at a carefully aimed target. A shotgun shoots a spray of metal balls (shot), usually at something that is flying and/or moving. Because the target is moving, you don’t aim a shotgun like a rifle because you don’t have time for that. You point it and shoot. So, my initial problem was that I needed a shotgun. More specifically, how do I sneak this into the family budget? I ended up making a weight loss deal with my wife. If I can get down to 170 lbs (I was 195 at the time), I would reward myself with a shotgun. This was actually a win-win-win for everyone involved. If I got down to 170, my life insurance rates would decline significantly, my wife would get a less chubby husband, and I would be a bit healthier. And, of course, I could get a shotgun to fulfill my hunting aspirations. Side note: For 4 or 5 years I’ve had a weight goal in my new year’s resolution. I have never met any of them. EVER. This year I gave up on it and removed the weight loss goal from my list. This is also the first year that I crushed every weight goal that I’ve ever had in my life. Who knew? All it took was a shotgun dangled in front of me. I realize that this doesn’t have much to do with hunting… but if you’ve been looking to lose a little weight, maybe you might be able to kill two birds with one stone, too. 1. I probably made the best choice for optimizing on price. A pump-action shotgun is about as low end as you can go. Frankly, I wasn’t even sure if I was going to like hunting. I wasn’t about to invest a lot of money on a high-end or even a medium-end gun. I just wanted one that could get the business done. 2. If I were optimizing for hunting experience, I would have bought a semi-automatic. When a flock of birds come in, you don’t have a lot of time to fire off 3 rounds. (3 rounds is the legal limit for how many shells you can have in your shotgun when duck hunting.) And every time you pump, it takes a bit of time and you will have to readjust your aim. With a semi-auto, you just pull the trigger 3 times, and you’re done. With that said, our hunting guide had a pump action (a Benelli Nova), so it’s not that big of an issue. You’re probably looking at $1000 at least for a semi-automatic. Likely around $1,400. 3. If I were optimizing for accuracy, I would have got a shotgun with a wood stock and paid more attention to the fit of the gun. With a shot gun, you don’t have a lot of time to point it. You need to be able to bring it up and shoot very quickly. It should feel natural against your cheek and shoulder. If the stock is too long, or it doesn’t rest right in your shoulder, then it’ll definitely affect your accuracy. With a wood stock, you can make adjustments to it by shaving it down if necessary to fit your body. I got a composite stock which means you get what you get. Not a lot of adjustment you can do, other than get used to it. Keep in mind that this is not gun buying advice – it’s just things I’ve noticed as a newb. Once I got my gun, it was time to figure out how to use it. I found a few trap shooting ranges in the Puget sound area. One is in Kenmore and the other is in Renton. The Renton one is about 30 minutes away from my house whereas Kenmore is about an hour, so I usually go to the Renton one. I read the reviews on them, and it made it sound like the people that work at Renton are mean range overlords, but I’ve only had a pleasant experience there. The man who works there was very helpful and was accommodating that I was new to this. He came out to the range with me and showed me how to use the equipment. The Kenmore range is also very nice, but a lot more crowded. They also have Sporting Clay 5-Stand where they shoot out clay from about a dozen different stations. It’s to simulate more closely to a hunting environment where your target can really come from anywhere. Even if you never go hunting, a shotgun is fun because you can go shoot trap. When I first lined up at the trap line, I was a bit apprehensive because I’m about to shoot a shotgun for goodness sake! But, after a round of shooting 25 clay pigeons, it felt a bit like shooting hoops. My first round of trap was embarrassingly horrible. By the results, I would have thought my gun was malfunctioning and it wasn’t actually shooting anything. But, the powerful recoil and the bruise into my shoulder assured me that it was indeed shooting. Over time, people at the range saw my sorry state and started giving me some advice. Once they saw that I appreciated their advice, they gave me more. I seem to be shooting between 33-50%, which is still not great, but a decent improvement from when I started. I figure it just takes practice. There are some people at the range that look like they can’t miss. They are incredible to watch. Some people (usually those that have played a lot of first-person shooters) believe that a shot gun will spray an enormous cone of shot into the sky – that it’d be difficult to miss a bird or clay pigeon if you just point the gun in its general direction. Let me assure you, it’s not quite that easy. I would liken it to putting your camera on zoom mode so that a bird or clay pigeon takes up the entire frame, then trying to take a picture of it within 1 second as its flying by. Next was the hunting license. In Washington state, if you’re under a certain age, you are required to go through hunter education. The cut off is if you’re birthday is after 1/1/1972. The Washington state site gives the exact details. You have a few choices with the Hunter’s education. You can sign up for a week long course typically sponsored at a gun range or you can take an online course with a field evaluation follow up. I chose the latter because I just couldn’t take a week off to do this. There were some intensive weekend courses, but typically you still had to take Thursday/Friday off as well as attend on Sunday. The online version was nice. I could go at my own pace and do it on nights when I had some time. It was a long course. It took me about 2 weeks to complete and probably between 6-8 hours. You can’t fast forward, and there’s a mechanism where you can not just flip through the pages. They give you a little quiz at the end of each section and final quiz at the end of the course to certify that you took the training. I actually found the training very useful. A lot of it was common sense, but sometimes it’s nice to hear the common sense because a lot of it I wouldn’t have necessarily thought about unless it was put in front of my face. If you’re new to hunting, I would highly recommend it even if you don’t need to take it. It’s $20 and well-worth the time and money. The most difficult part about the hunter’s ed was scheduling the field evaluation. I would recommend doing the online training early in the year (like March or April). You should decide on 2 or 3 different sessions that you could attend. Each field evaluation class will likely get sold out sometimes within minutes of opening the registration, especially if it’s Puget Sound area. After getting burned a few times, I finally wised up and marked the registration day on my calendar and registered right when registration opened. The only option I had left was down in Longview which was about a 2.5 hour drive, but if I wanted to go hunting, that’s what I had to do. I was surprised at the field evaluation to see that about a 1/3 of the participants were kids. Many were under 14 years old. I was equally surprised to see that another 1/3 were women. Not the back-country women with missing teeth that one might expect at a hunter’s education course, but well-dressed and made-up women mostly in their 20’s. There were not a lot of men that were my age. I suppose if you’re my age, you’ve already chosen if you’re going to be a hunter or not. Either your dad taught you to hunt when you were a kid, or you’ve decided you’ll get your meat at the super market. The field evaluation was pretty easy. They made you (and helped you) shoot a rifle, walk over an obstacle trail with a gun with a partner, then answer some questions about how to place your gun in a car. I drove a total of 5 hours to do this evaluation (which took about an hour), but in general I felt all of these issues were good ones to review with new hunters. I’m sure it saves lives. Once I turned in my Hunter’s ed papers at the field evaluation, I could get my license. I had some trouble getting it online as well as at Fred Meyer. Apparently, if you have just taken Hunter’s Ed, it takes a while for the information to get through the system. I ended up calling the number (360-902-2464) and ordered it over the phone. They were able to find my hunter’s ed information pretty quickly and processed the license for me. Finally, I was ready to hunt. I got the equipment, the skills (bare minimum), and the license. My buddy (and bishop), Shawn, recommended a guide service and referred me to EchternKamps Guide Services. I figured that since I have no idea what I’m doing, I should go with someone that does. This turned out to be a great decision. After having done it, I’m sure that if I tried to do this on my own, it would have a cost a lot more money and we would have been completely unsuccessful. 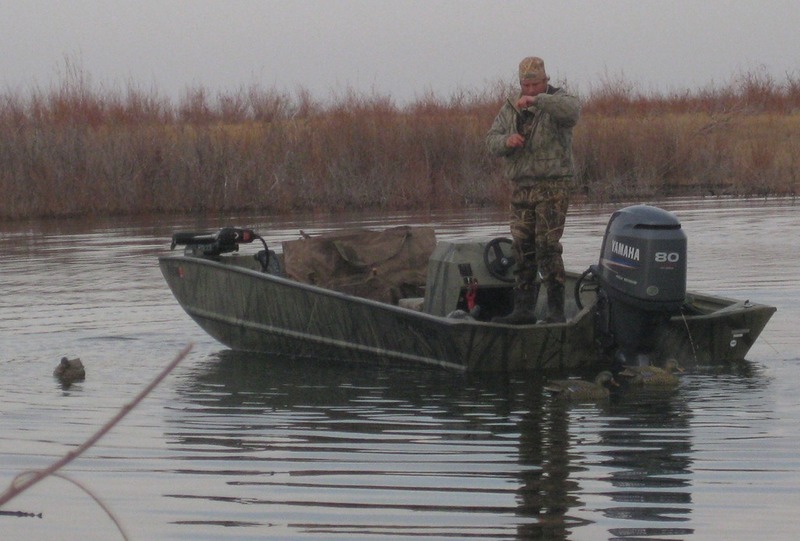 The cost of the guide service was $150 for a duck or goose hunt. To do both, it was $225. Once I started telling some folks that I was planning on going, I very quickly found 3 other friends that were interested. Luckily they were a bit older and didn’t need the hunting education, or they already had a hunting license. None of us had ever gone duck hunting before and 3 of us were first time hunters. We set a date for Thanksgiving week and chose to do duck hunting. 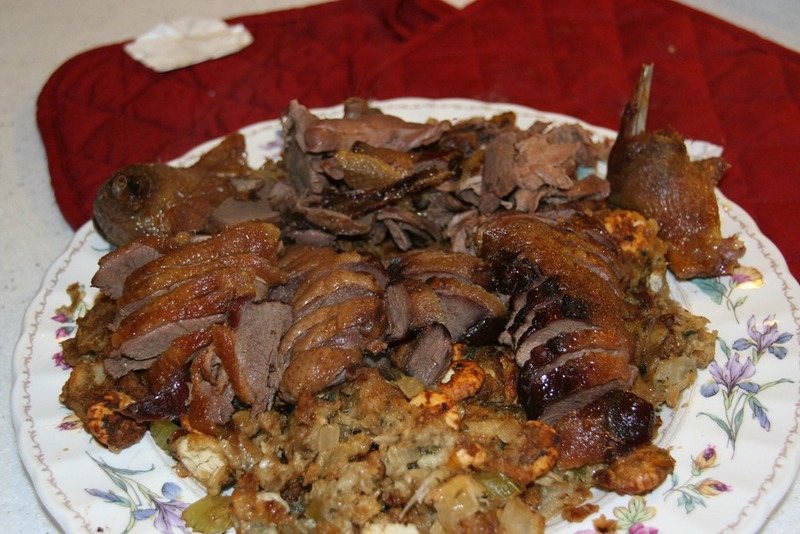 I figured we could eat some ducks for Thanksgiving. We got a room at the Ramada at Moses Lake. My wife thought it was a bit strange that 4 dudes were going to share 2 beds. I guess I would have thought it was a bit strange, too, but I figured we’re going hunting. The machismo of hunting would override any weirdness about 4 guys in a hotel room. I brought my sleeping bag and maybe 1 guy could take a couch. Ended up that my wife was right. It was a bit weird. So, we called an audible at the Motel and got an extra room. The lady there was extremely accommodating. She overheard that we’re going hunting and that we were going to wake up at 4:30am. She asked if we would like breakfast made. We told her that it seems like that would be too early, and she said that she makes it herself and there’s nothing else to do. We thanked her for accommodating us and agreed on breakfast at 4:30. We went right to bed around 9pm so that we could wake up at 4am. I had a tough time getting to sleep. Probably because of the excitement of the hunt. After what seemed like hours of tossing and turning, the alarm fired off at 4am. I got dressed in layers and layers and layers of clothes. We went downstairs and as promised, breakfast was waiting for us. Eggs, sausage, salsa, pastries, toast, biscuits and gravy. Yum. We met our guide at the Texaco across the street. Our guide was a man named Curtis. He was probably in his late 20’s or early 30’s. We drove about 20 minutes to Pothole reservoir. If you look at the lake on Google Maps, you’ll see that there’s a whole bunch of spots on the lake. Those spots are little islands on the lake. It was dark when we boarded the flat boat and drove for about 30 minutes into the lake. We eventually landed on one of the small islands where there was a blind made from some chicken wire and brush that was growing on the island. It was big enough for all 5 of us to sit in comfortably. Curtis brought 5 small stools and buckets for us to all sit in. Chris and I didn’t bring any camouflage, and the guide gave us a few coats. I thought we would be hiding in one of those coffin blinds and didn’t think we’d need camouflage. But, in this blind, I quickly saw that we needed camouflage to be hidden. I was wearing a blue knit hat and that would obviously be suspicious to any birds approaching. Luckily the camo jacket that I got had a hood. It was 6:30am when we got started. It was dark and cold. I was told that it was a “warm” morning, relatively. It didn’t feel “warm”. Chris brought some hand warmers and I was glad to take one from him. The guide told us that the day before, they were hunting the entire day and got one short of limit (7 ducks per person). He said that was a bit unusual. Sometimes, you have days where hunting is done at 9am because everyone shoots their limit in ducks. He also said that sometimes it feels like it alternates days – good days and bad days. So, we were very optimistic and anxiously awaiting our first flock of ducks. Weather-wise it was perfect. Overcast, but no rain. The guide told us that if it’s too sunny then we’re seen easier by the birds in the blind. Curtis put about 4 dozen decoy ducks in the water. Each bird was tied to an “anchor” with a thin string. He also set up a duck that looked like it was flapping its wings. There was a string coming from that duck so that Curtis could control it remotely. Every time he pulled the string, the duck would “flap”. We all stood up. A single duck was flying in from behind our blind across Shawn’s side. Only Shawn had a shot. The rest of us would risk shooting Shawn if we took a shot. Shawn raised the gun and followed the duck. He fired a shot, and the duck glided into the water. Wow! I think Shawn surprised himself. Mavis, our black lab, ran into the water to retrieve the duck. It was a Mallard. The guide got the duck from Mavis and passed it around. It was pretty. I’ve never held a duck in my hands. It was a bit sad to see the shotgun wound in it. But, at the end of the day, it was poultry. Duck hunting is a lot like fishing. 99.9% of it involves waiting. Then, there’s .1% of the hunt where the ducks fly in and we try to shoot them. In duck hunting, there are 2 exciting parts to it. One is seeing a flock of birds and trying to call it in. The second part is, of course, trying to shoot them. 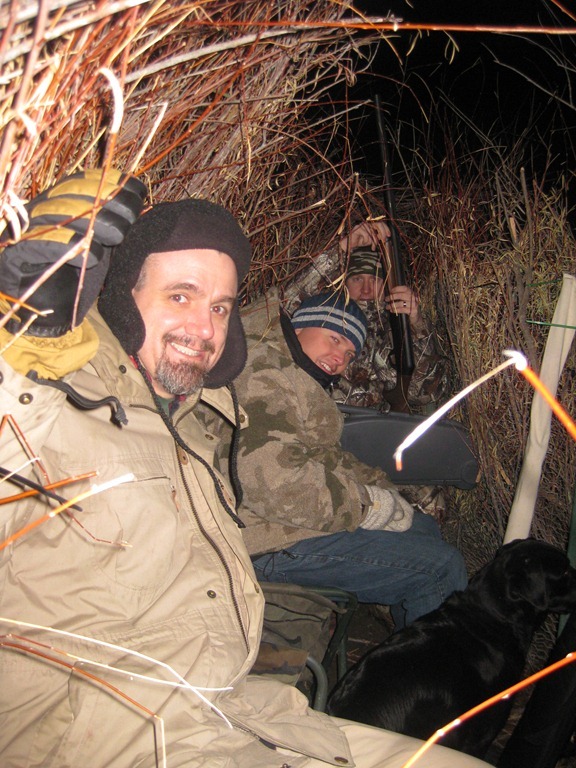 Whenever we’d see a flock of birds (about every 30-45 minutes), we’d all duck our heads low behind the blind. Curtis would start quacking with his duck call and flap the decoy duck wings. The rest of us would chant beneath our breath, “come on duckies… come on… “ Most of them don’t fly in. In fact, there’s only one type of ducks that actually fly in and land, and that’s the Mallard Ducks. Mallard Ducks are also the biggest ducks we saw. The other type of ducks that we saw were called Teal Ducks. Teal Ducks are about a 1/3 of the size of Mallard Ducks. Teal ducks do not land in the water. They may loop by close, but in general, they are just flying by. For Mallard Ducks in general, we would wait until they land in the water, then stand up and start shooting. Teal Ducks, we just have to start shooting when we think they are about as close as they are going to fly to us. 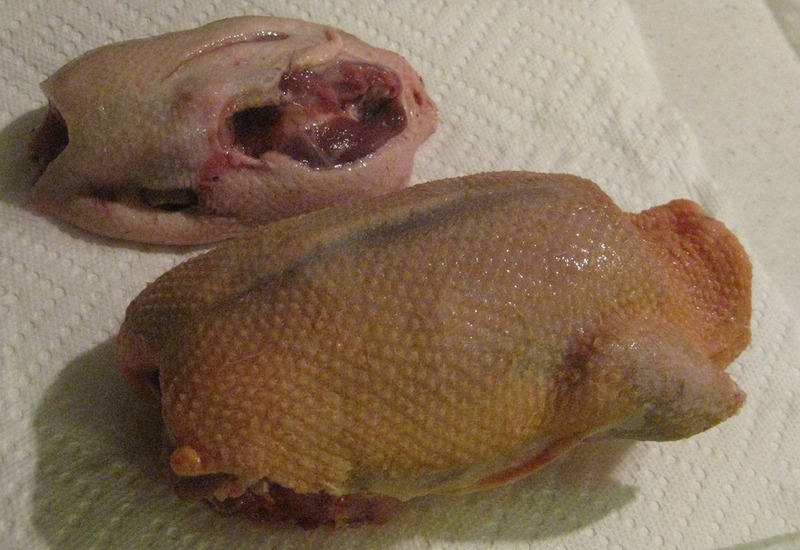 Also, there is a limit of two Mallard duck females per person. If we hit our limit on female Mallard ducks, then we have to stop shooting at them if there are any Mallard duck females in the flock. Since it’s so hard to tell when they’re in the air, in means that we’d be done with Mallards. When the second flock flew in, I was so excited that I had not set my feet well when I stood up. Everyone fired off their 3 rounds except for me. I fired off 1 because when I fired, the recoil pushed me back into my stool. It was a long time before the next flock flew in. By this time, I was chatting it up with my hunting buddies and not paying too much attention. So, when Curtis suddenly yelled out “Take’em!” I was totally unprepared. I grabbed my gun, and fumbled with the safety while I heard a barrage of gunshots. It took a few seconds for me to get to my feet, but by the time I stood up the ducks were out of range. I pointed my shotgun and watched them fly away. The birds took us by surprise because they flew in from behind us. Everyone was reloading their shotgun when I embarrassingly admitted that I had not fired off a shot. From that point on, I was a bit more attentive and fired off all 3 rounds in subsequent engagements. To be honest, the morning was underwhelming. I think all of us had expectations that there’d be a lot more ducks. By noon, we had shot about 9 ducks. About 6 hours had passed, and this was not a pace to shooting our limit (28). The sun had also come out and the guide told us that was not good. It means the ducks could see us better hiding in the blinds and will be less likely to land. Then it happened. About 12:30, we saw the mother flock. There must have been about 20-25 ducks. It was the biggest flock we’ve seen up to that time. We hunched down in the blinds clutching our shotguns, chanting, “please duckie… come on… come on… “ Curtis was quacking and flapping, quacking and flapping. “Come on… come on… “ Then we saw the lead duck turn and come flying toward us. It glided in toward the decoys. The entire flock turned and followed the lead duck… It was almost like watching an alien landing. We were fighting our instincts to stand up and blast away… I heard someone (and it could have been myself) whisper “Hold it… hold it… “ We wanted to wait until most of the flock were within range. Then, we heard Curtis, “Take ‘em!” And it was like a pack of wild horses were unleashed. We stood up and the air filled with shotgun fire. Ducks dropped out of the sky one by one. We ended up getting 6 ducks out of that flock. After the lull we were in, the experience of seeing such a big flock fly in recharged us. We ended up staying until about 3pm and got 20 ducks. 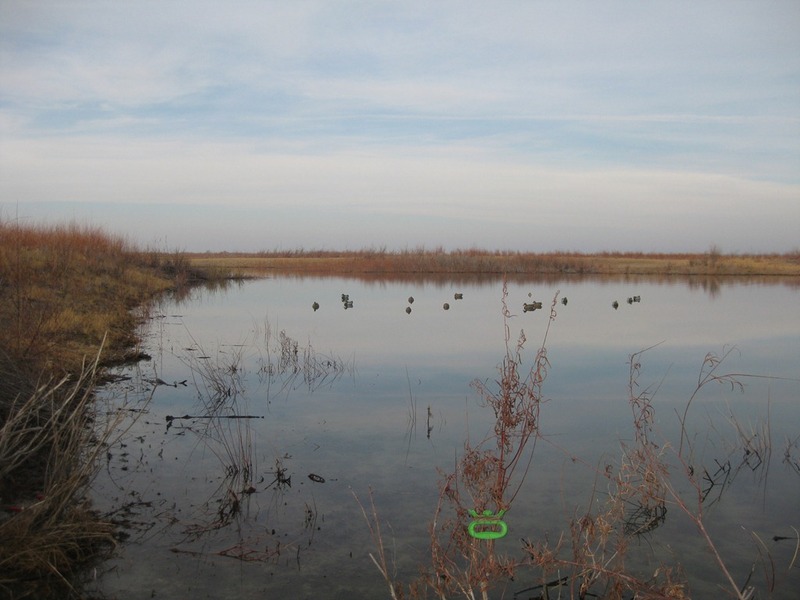 Curtis took some time to retrieve all the decoys while the rest of us packed away our gear. 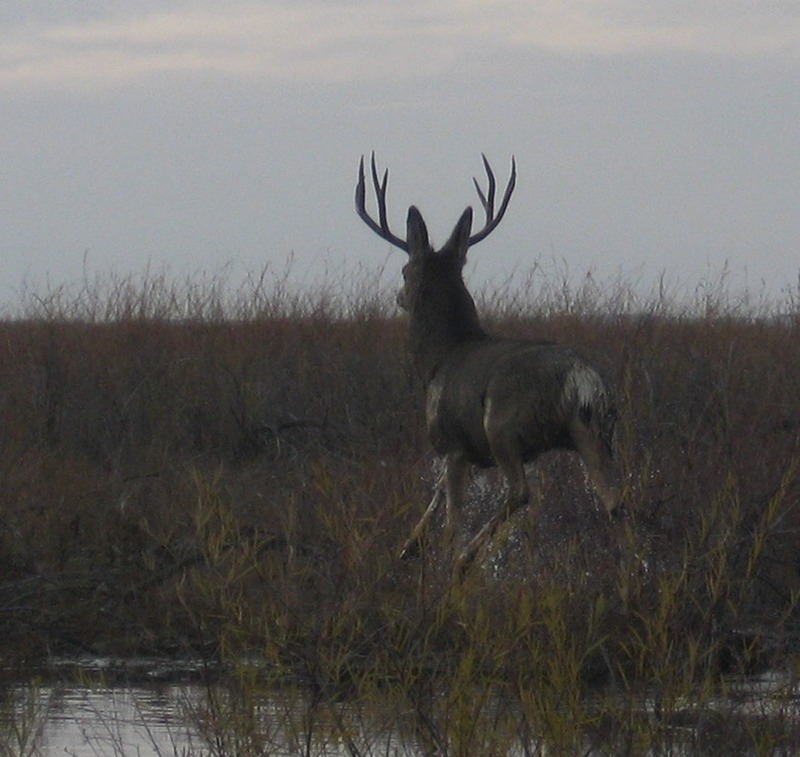 On the way from grabbing the boat, he saw a 4-5 point buck jumping around from island to island. He had us jump in the boat and got right up next to snap a few pics. On the way home, there was quite a bit of snow on the pass. The good news was that we knew our ducks would be well refrigerated. I ended up getting home about 8pm. I brought home 2 Mallards and 3 Teals. I found out that the real hard work with hunting is dressing the animals. I wanted to get them clean and in the refrigerator so that they wouldn’t spoil. The first thing I did was pluck the feathers. I dipped them all in boiling water for about 10 seconds. Then I took them outside and started plucking into a paper bag. This was very messy. The feathers came out pretty easily, but it was difficult to get them off of my gloves. It took about 10 minutes for each duck. Then, I brought them inside, and chopped of the head, the wings, the legs, and the tail. Finally, the gruesome part – I emptied out all of their organs. This was smelly business and completely unpleasant. After doing this to 5 ducks, I was so very grateful that somebody else does this for us for the poultry that we buy in the supermarket. For me to turn a bird into a piece of meat that I would get at the store took about 30 minutes each, and it was not fun work. I’ve seen some youtube videos where people just pull out the duck breast in a few minutes. That might be the way to go in terms of efficiency. 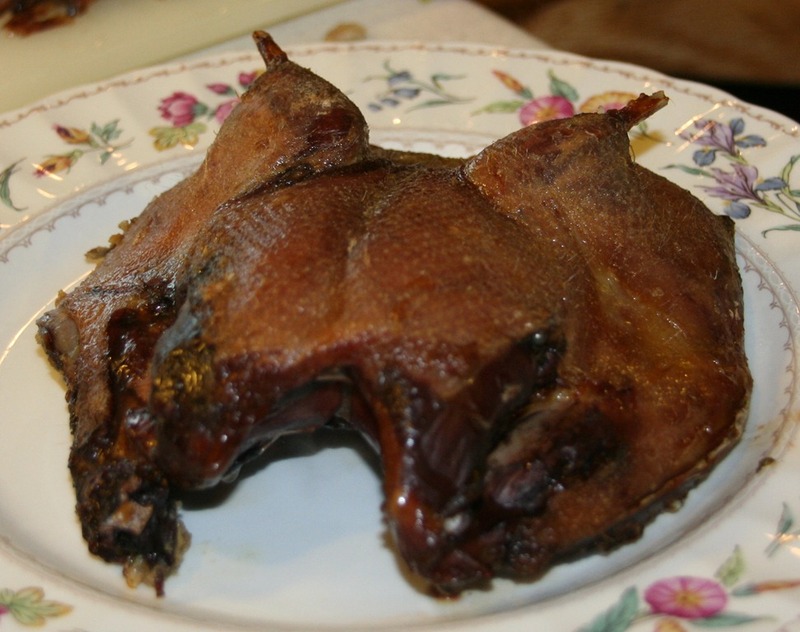 In general, I love Peking Duck and the crispy duck skin. We’ll see if all the plucking was worth it. Curtis also recommended dropping off the ducks at a processor who will turn it all into pepperoni sticks. After a few hours of cleaning ducks, that seemed like a fantastic idea. Finally, at about 11pm, it was finished. Ducks were dressed and in the freezer. A few notes to myself for the next hunt. 2. Wear warmer clothes – especially for feet and hands. 3. No need to bring 3 boxes of ammo. You’ll be lucky to get through 1. 4. Take pictures/video of the actual “Take’em” moment. 5. If I get serious about hunting, a semi-auto would be a good investment at some point. 6. Try Goose hunting. The goose limit is 4. 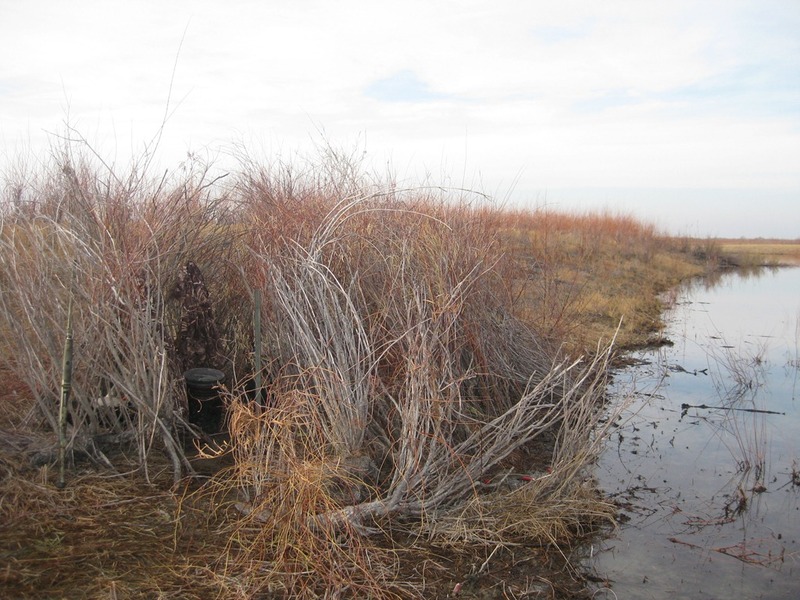 Goose hunting happens in the field in either coffin blinds where you lay down in the blind and pop up, or in an underground blind. Curtis also told us that in general, you’re up a little closer to the Geese than the ducks. Overall, it was a pretty fun experience and I’m definitely glad I tried it. I’m pretty sure I’ll do it again, but after the cleaning experience, I wouldn’t mind if it wasn’t too soon. P.S. – Ate the duck. I tried Alton Brown’s Roast Duck with Oyster Dressing recipe. It was good. Better than I thought.